Airbus has shared new footage of its autonomous robot taxi taking to the skies for the first time. 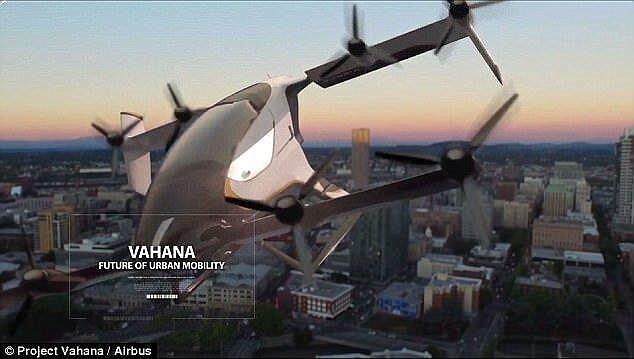 The flying taxi, dubbed Alpha One, is part of Project Vahana, the aerospace giant's advanced projects division. The video shows the self-flying drone hovering above the ground for about a minute or so, before smoothly lowering itself back to the ground. Airbus posted the video on Thursday, a month after the test flight took place at the Pendleton Unmanned Aerial Systems Range in Oregon, close to a nearby airport where the craft has been stored since November 2017. AlphaOne is a full-scale aircraft that's all-electric and self-piloted. The self-piloted aircraft is 20.3 ft (6.2 m) wide, 18.7 ft (5.7 m) long, 9.2 ft (2.8 m) tall and has a takeoff weight of 1,642 lb (745 kg). 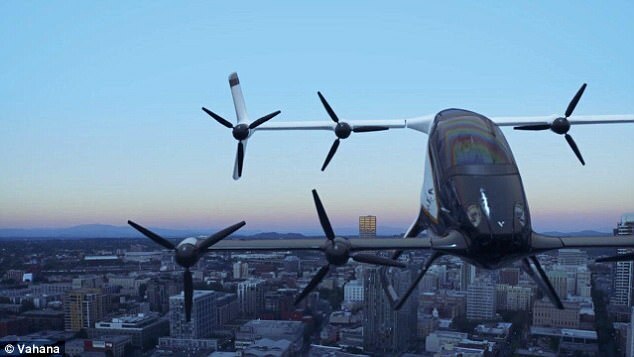 It has eight propellers and a six rotor design that allows the taxi to take off vertically, then adjust its wings to move directionally. 'During our minute-long flight, the primary battery system used about 8 percent of its total energy, demonstrating that the vehicle is capable of much more,' said Zach Lovering, a project executive at Vahana, said in a description of the video. 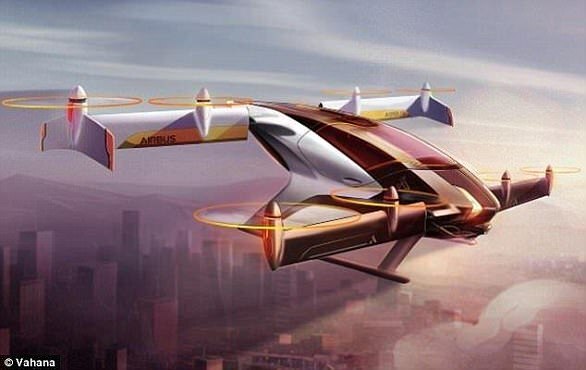 Airbus hopes to create a fleet of self-flying taxis in the near future, with plans to have a commercial version of the AlphaOne in operation by 2020. Alpha One climbed to a height of 16 feet (five metres) before successfully returning to the ground at 8:52am PT (11.52am ET / 4.52pm GMT). The single-passenger taxi was able to maneuver itself without the input of a human operator. Future tests will transition from hovering off the ground to directional flight. 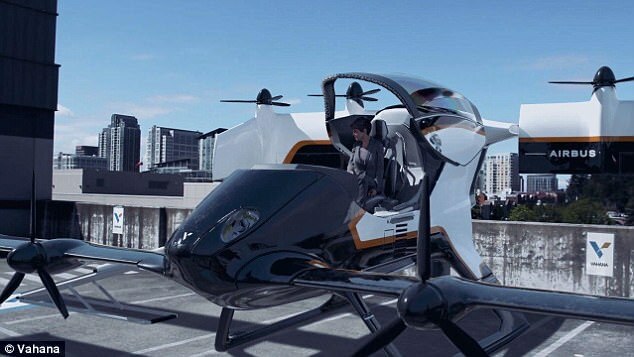 If successful, they could lead to the creation of commercial self-flying taxis to help commuters avoid the ever-growing issue of traffic during rush-hour in congested cities across the world. In a previous statement, Lovering said called last month's test a 'historic day for Airbus, A³, and the Vahana team'. 'After two years of planning and building, we are thrilled to see our efforts culminate in successful flight. 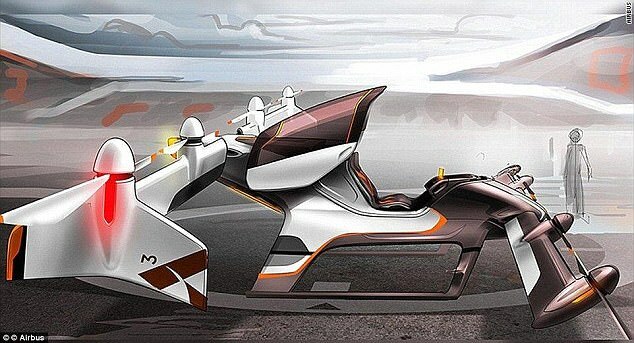 Vahana's sleek self-flying aircraft seats one passenger under a canopy that retracts in similar way to a motorcycle helmet visor. The vehicle is designed to operate like a helicopter. The vertical takeoff-landing (VTOL), all-electric aircraft is made up of a cockpit mounted on a sled, flanked by propellers in front and back. Project Vahana began early in 2016 and is one of the first projects at A³, the advanced projects and partnerships outpost of Airbus Group in Silicon Valley. 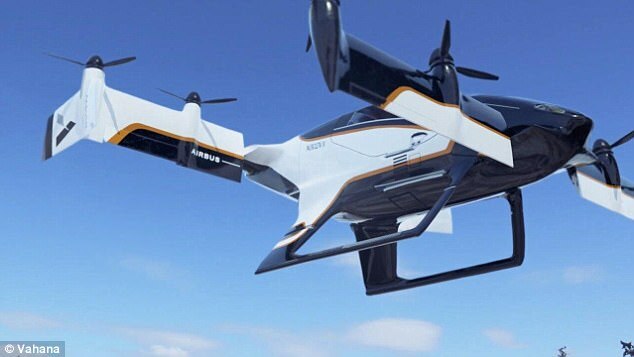 About the successful test flight, Mr Lovering added: 'Our aim has long been to design and build a single passenger electric VTOL self-piloted aircraft that will answer the growing need for urban mobility. 'Our goal is to democratize personal flight by leveraging the latest technologies such as electric propulsion, energy storage, and machine vision. 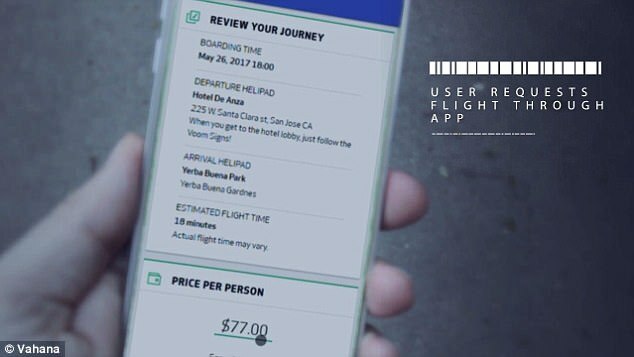 In June 2017, Vahana released a concept video showing what passengers could expect from a future flying taxi service. The two minute clip depicts Deborah, a computer-generated character who needs to get from the Hotel de Anza in San Jose to Yerba Buena Gardens in San Francisco. 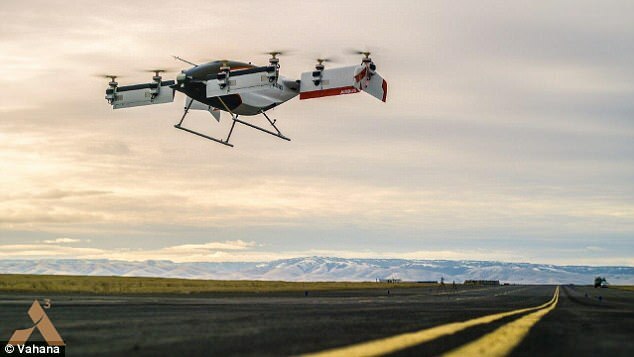 Rather than contend with traffic on the ground, she orders a Vahana flying vehicle to pick her up from the nearest 'vertiport' using a smartphone app. Vahana collects her and completes the 42 mile (68 km) journey in 18 minutes, for a total fare of $77 (£54). The footage also shows off some of the anticipated features of the vehicles, including automated obstacle avoidance and on-board climate control. 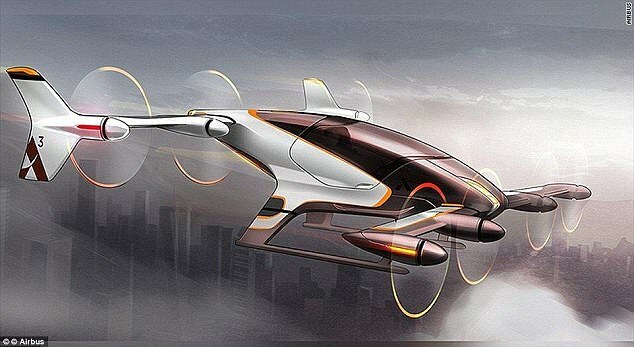 HOW DID AIRBUS' FLYING TAXI COME TO BE? Project Vahana began in early 2016 and is one of the first projects at A³, the advanced projects and partnerships outpost of Airbus Group in San Jose, California. The first conceptual artist's images revealed a sleek self-flying aircraft with room for one passenger who sits under a canopy that retracts in a similar way to a motorcycle helmet's visor. 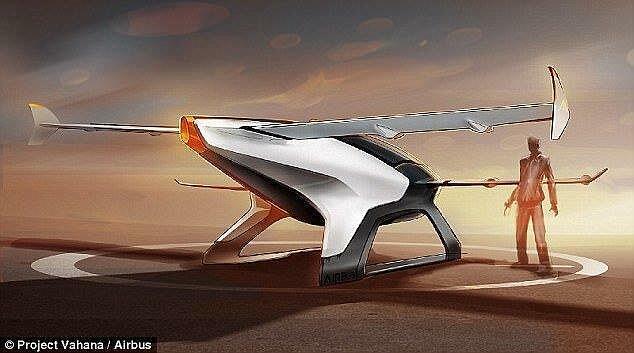 The air taxis will take off and land vertically, thanks to tilting wings which are each equipped with four electric motors. 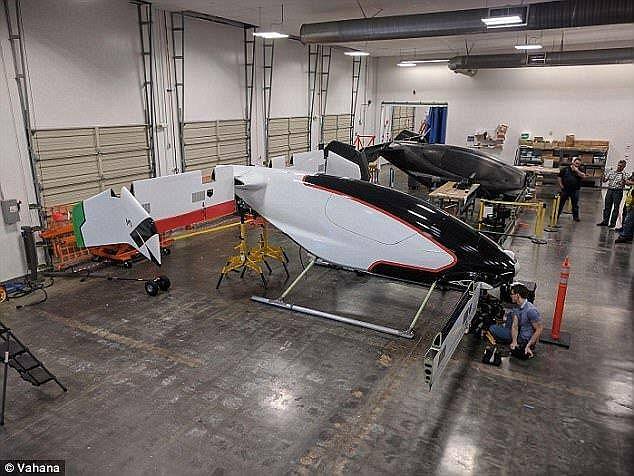 In November 2017, the Vahana craft completed its move to the 9,600 square foot (892 sq m) Pendleton Hangar at the Eastern Oregon Regional Airport, in what the firm called a ‘monumental’ step toward the first flight. In less than a day, the team reassembled the craft, allowing them to then install the high voltage power system and motors that will power the first test flights. It also carried out the first end-to-end flight test simulation, combining real and simulated data. A³, pronounced A Cubed, had aimed to have a full-sized prototype in the air by the end of 2017. It missed this deadline by a few weeks. Project Vahana's full-scale aircraft, dubbed Alpha One, took to the skies for the first time on January 31, 2018. Alpha One climbed to a height of 16 feet (five metres) before successfully returning to the ground. A commercial model is planned for sale by 2020. 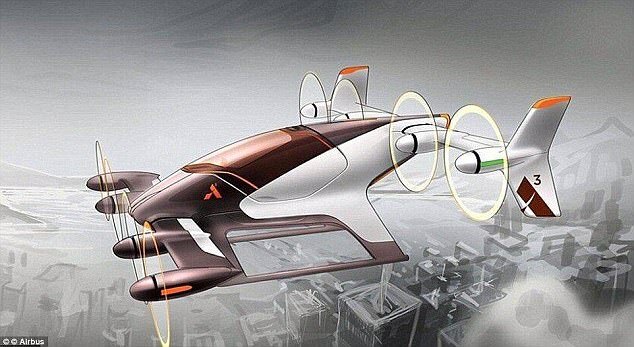 Airbus has revealed its airborne vehicles will cost ‘the equivalent of a normal taxi’, around $1.50 to $2 (£1 to £1.50) per mile.